Ready for a bit of bullet hell? 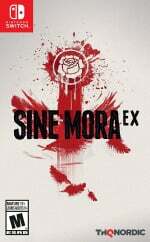 If you're a bit of a shmup fan then you will likely be over the moon to hear that THQ Nordic is planning to bring Sine Mora EX to the Nintendo Switch. The game has recently received a rating from Brazil's answer to ESRB. Previously released - in non-EX form - on platforms like PS3, Vita and PC, it's a stylish shooter from Grasshopper Manufacture that tells a fairly serious tale; or you can shoot for high scores in arcade mode. Time manipulation is a key mechanic, and the game features over 50 weapon combinations to try out, while difficulty scales to the player's ability.. The soundtrack is composed by Akira Yamaoka, and the game features boss designs by Mahiro Maeda. If you are a fan of bullet hell games then this should be worth keeping an eye on. 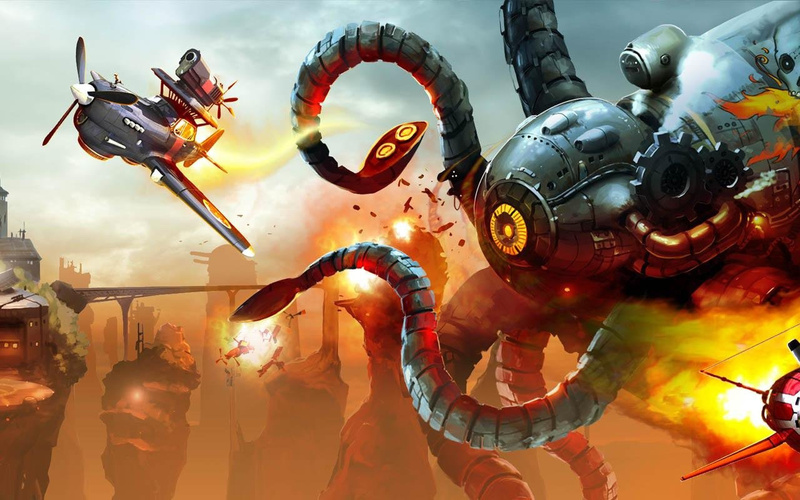 Let us know what you think about Sine Mora coming to Switch with a comment below. I find it all the more ironic that Lock's Quest and De Blob doesn't have a Switch port, but good on THQ Nordic for pledging support regardless! It's got a mid-80s scoring on Metacritic...a good addition to the library and excellent to see THQ Nordic onboard. Sweet! Never beaten this game on the Vita but good news nonetheless! This looks surprisingly good, can't believe I missed it before. Yamaoka scoring a shmup grabs my attention. Got the regular version on PC, so I'll pass for now. Overall I thought it was an ok shm'up. Will still buy it though. I do seriously hope that Sega is looking into releasing all those Technosoft games they own on the Switch. Yup, I had a lot of fun playing the game on Vita and will definitely be buying it for the Switch. Looks great ! The launch trailer is beautiful ! Nice!! Gimme retail option too!! @FX102A being they were never brought to any virtual console, I'm pretty sure Sega doesn't own them. @joey302 Sega acquired the rights last year. Thunder Force III is being prepped as a 3D Classic release. This is a nice little victory for the Switch, if it's done right. Never heard of it, but it looks great. I'll be getting it. I got it on PC but never beat it plus no controller... But I will be picking this up. Loves me some shmups. I honestly found it a bit meh. Especially with the story and especially the constant character switching getting in the way of just enjoying yourself. Agree. It's a gorgeous game but the fun-factor just isn't there. Designers of modern shmups need to look back at 90's games to figure out what made them so fun and addictive. Just watched some gameplay. Dont know why but i never played those kind of games. Looks really good visually. I think its fun and i want it. Maybe i wont wait and get it on pc. Wish it was vertical, but looks really polished. It's easy to make a shmup, it's hard to make a good one. This looks crafted and seems to have a lot of positive feedback. I'm interested if I ever get a Switch - physical please? COOL! looks like STEEL EMPIRE! Too bad it's such an old PC game but it's great I can carry it around and easily play it now. More shmups, more shumps! was waiting for this to come to xbox one back compat forever. no longer! Day 1. Give me shumups...give them all to me. Got it on both 360 and PC... will most likely get on Switch as well, as it's a real gem! It's OK. Needs a major gameplay overhaul. First step, lower HP on flak enemies. If they don't even manage that... Well, I doubt they can fix the maze levels eitherway. I a huge Shmup fan, and while I should love a game like this, I simply found it okay. The problem is that it tries to shoehorn in this deep and serious plot about war and vengeance that sort of slows things down and confuses you when you just want to get absorbed into the action. You'll play as various anthropomorphic animals in different time lines with different planes, and the whole thing never feels like a coherent story with any real progression. Some of the later stages start to feel more like tedious physics puzzles than action twitch fare. On the upside, the game looks gorgeous with a unique sense of style and design direction. The actual controls and animations are fluid and feel "right"...but the experience itself left me wanting to play a more traditional shmup that had such beautiful graphics. @TossedLlama -It's not as fun as Steel Empire, but the game play is smooth and the graphics and design are beautiful. I don't recommend Sine Mora, nor do I say you should avoid it...it's definitely a divisive game for shmup fans. I vaguely remember something about the developer ceased to exist. But maybe I'm wrong? Don't get thrown off by the outlandish voice acting, it's a great game! If you haven't already played it or want it badly on the go, you should pick it up if you are an open minded kind op schmup/arcade lover. Played a demo many years ago and found it boring to the point that I only remember how boring it was. If a demo for this version comes out, I'd give it another shot. I've never heard of it. It looks good, I love shmups, definitely wanna try this. Does this have co-op play? Game was amazing on Vita. Can't wait to see what the EX offers. @saturn_hero IIRC, the Vita version does not, but the ports may. Good game not great. Also this is NOT a bullet hell game.Mushihimesama futari is a bullet hell game. Not Sine Mora. I never finished S&P Star Successor but I loved what I played. An HD remaster package of both games would be another day one buy without question. Both provide a nice challenge from what I remember. Looks very good. And balls-hard from what I have heard. Ironically shmup fans hate this game. Never heard of this but im going to buy this. Never heard of this before, but looks fun. Will definitely get this on Switch. I have this on Steam, but if it's priced reasonably I'll pick it up for the Switch. It's only $10 on Steam and can usually be found cheaper during a sale. I love SHMUPs but I didn't like this game much when I bought it on PC. Not interested in a new version of it. Yay, the return of Hungarian furries!